It's time for a change - Spring Ahead! As much as I dislike the time change, this weekend means Spring Ahead! Daylight Savings Time begins at 2:00 am this Sunday, March 11. 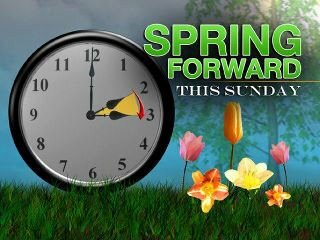 I'll be setting our clocks ahead one hour (Spring Ahead... Fall Back) before going to bed Saturday night. In addition, now is the also perfect time to change the batteries in your smoke detectors!